This is what West Coast hiking is all about. 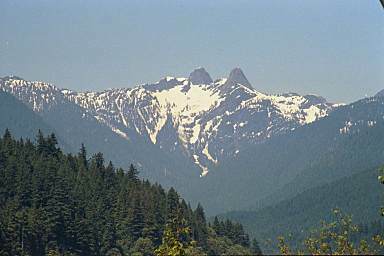 The Lions are the twin peaks that are seen from downtown Vancouver. They are also known as the Twin Sisters. I should point out that it is a very popular hike so if you go on a weekend , " go early " . The parking at the trail head is limited and the closest overflow parking is down the hill at a school 1 km away . This may not seem like much but after a long day on the trail , the last thing you need is a walk on hot pavement back to your car . To find the trail head drive to Lions Bay on Hwy. 99 . Take the right exit on Oceanview Road . Turn left on Cross Creek Road , then right on Center Road . Go left on Bayview and left on Mountain Drive . About 2 km. turn left on Sunset Drive . There is a small lot just before the gate . If this is full you have to go back down the hill and park at the school on Bayview Road . If you do get turned around or lost don't worry Lions Bay is not that big and there are only a few streets that go up hill . The trail starts out on a logging road and is a good warm-up for your legs for the trip to come. After about 30-45 minutes of steady walking you will come to a fork in the road , take the road on your right . There is a cute little sign posted on a tree to the left of the road pointing the way . In a short time there are peek-a-boo views of Howe Sound though the trees aftre which the road starts to narrow into a trail . You should reach Harvey Creek in about 1 1/2 hrs. there is a slight descent here and if it's a hot day this is a good spot to stop for a break , soak up the cool air and refill your water bottle . After you rock hop across the creek it's back up hill and this can be strenuous for new hikers . The bulk of the elevation gain is ahead of you . After about 2 1/2 hours of climbing on switchbacks , over or around huge logs and rocks you'll reach a viewpoint . 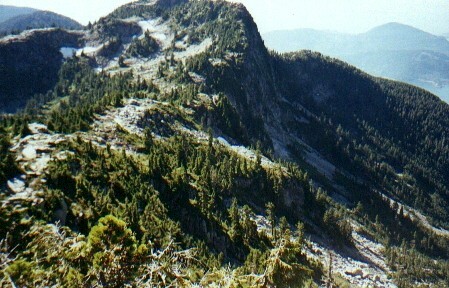 The waters of Howe Sound & Lions Bay are far below and you can see the slope of Mount Harvey with it's clearcut to the north . The rocks in this area are flat should you decide to put up a tent and explore the area for a few days . Going southeast from here up a rocky slope are wide open views , and the Howe Sound Crest Trail , which is 200 m above you . 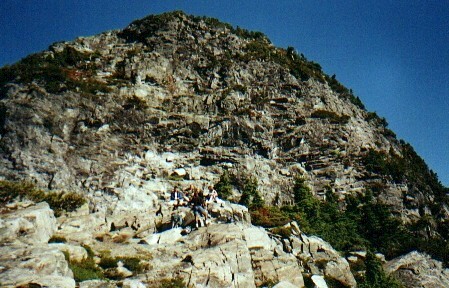 The day I was up the Lions Bay Search & Rescue group were on an outing and remarking the trail as well . Once you are on the rocky slope the trail is easy to pick up just follow all the orange dots . The guys did a really good job of marking all the way to the top . Once you make your way up to the top of the ridge you will see Unnecessary Mountain to the south and the West Lion above you . As you head away from Unnecessary Mountain ( northeast ) there is one last bump to ask your tired legs to get you over . Look around at the view and think about the great lunch you are going to have and that should give you energy to make this last little climb . Once you hit the top the Lions are before you . The view is outstanding . I was lucky to have a clear day . Vancouver lay below with Mt. Baker in the distance . The snowcapped mountains of Vancouver Island to the west with the Gulf Islands , Garibaldi Park - Diamond Head to the north and the Tantalus Range to the northwest . Now for the warnings : if you have your lunch on the rocks at the base of the East Lion be careful of the edge on the west side . The drop would be certain death . While I was on the trail I met a fellow from Germany . He had climbed in the Alps in Switzerland and wanted to climb to the top of the East Lion .this guy left me in the dust as he made his way up to the top . While I was having my lunch he made his way down from the top of the East Lion . He was shocked at how difficult the climb was . He also was thankful the the folks from the Lions Bay Search & Rescue were there to help him . So be content with your achivement and don't risk your life for " just a little better view " . Next time you are downtown with your friends you can point to the Lions and say, " that was one of the best climbs I ever did " . Note; The towing of vehicles that are illegally parked is starting up soon and it may start on Mountain Drive too so you need to go to the school parking lot. Towed vehicles go to North Vancouver and hikers may end up stranded in Lions Bay if the buses aren't running. The overflow parking is available near Lions Bay Elementary School on Bayview Road, just south of the school. 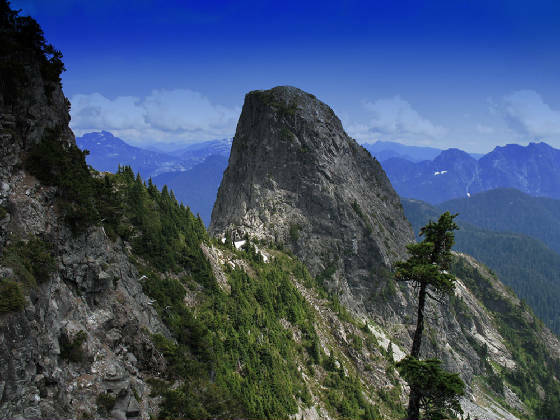 * Note , should you get into trouble Lions Bay Search and Rescue cover the area of the Howe Sound Crest Trail from St. Marks Peak and the area north to Britiannia Beach. Also this is a free service if you are lost or hurt. it's much better to call rather than them remove your body.